If you haven’t heard about Novica (www.novica.com), they are a subsidiary of National Geographic. I was contacted several months ago about writing a sponsored post regarding the company and it’s products. My editorial schedule was a little full, and then they contacted me again. Quite frankly, I have a lot of respect for persistence, so I checked out the website, and fell in love. I am a huge supporter of free trade, and I think it’s important to support any organization that helps other countries and artisans not only “preserve artistic traditions”, but create viable & sustainable business. The disclaimer: Unless it’s something I would purchase, it will never appear in my blog. The musings and opinions about Novica are entirely my own. We see global references in design everywhere this year, in fact one of my favorite online companies Williams-Sonoma Home has devoted an entire catalog to global influenced offerings. Or design icons like Vicente Wolf, scour the world looking for unique, handmade products to incorporate into his signature designs. For those of us who don’t have the time or the money to visit faraway places, Novica (www.novica.com) gives you an opportunity to access handcrafted product from even the most remote locales. The product offerings are vast from clothing to jewelry to home decor, and they bring further awareness to the artists by showcasing select stories. I am a huge fan of layering interiors with natural textures and mixing them with exotic elements for good measure. While I do love beginning with a neutral foundation, I also love “punches of colour” and the products offered by Novica (www.novica.com) cater to any design style or colour palette. You can mix and match pieces from their collection with pieces found on your own worldly travels. Not only do they scour the globe for artisans, but many come from impoverished rural areas giving them a “free platform” to reach buyers on a global scale. Through the efforts of Novica and their commitment to helping others, these communities have the freedom to make a success of their craft by building a business that not only helps them on a personal level, but also supports local economies. 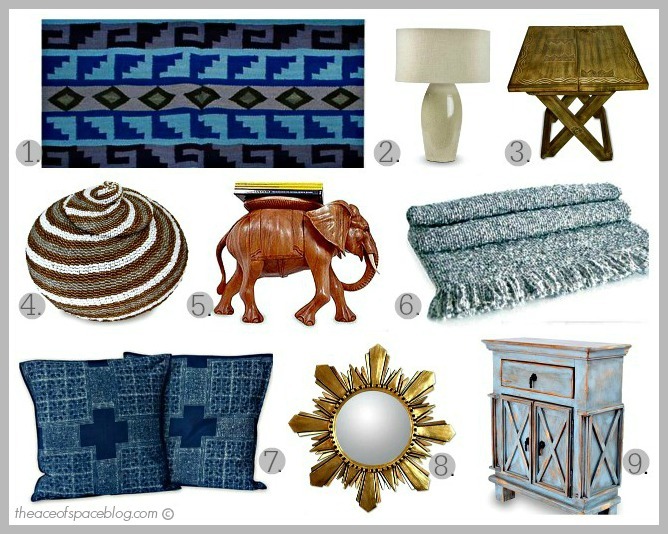 I spent several hours looking through the products, and came up with a curated list of my “Top Nine.” My inspiration started with the Blue Inca Empire Rug, and since I love elephants I found the most adorable Elephant Wood Stand. If you see any products that you want to purchase, act fast, because they are all handmade and come in limited quantities. P.S. With the generous gift certificate they gave me, I’m getting the Elephant Stand (No.5) for the Fashionista’s playroom. The products in the above collage were curated by The Ace of Space Blog. So if you want to add a little global flair to your home, Novica’s (www.novica.com) product offerings will give you endless possibilities. P.S. Next week I”ll be bringing more of the “Best of the Best” from BlogTour NYC. Also, The Ace of Space will be collaborating and partnering with a few national brands on our Master-bath Remodel, and as soon as the details are finalized I can share it with my readers. I’m so honored (and beyond excited) to have them on board and can’t wait to start the long overdue demolition on our builder grade bathroom, and share the ideas & inspiration with my followers.